I bought a Max Q Data VeQtr system today. I have been looking around for something decent, inexpensive, with a lap timer. 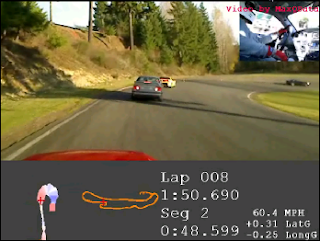 The VeQtr system offers video logging with 2 cameras on the base unit , and telemetry overlay. Our most popular VeQtr system combines the MQGPS-HiDef with a small netbook computer that captures the video and data and allows immediate viewing of the results. Two high-quality webcams can be mounted anywhere on the vehicle to provide many exciting video angles.² Supports up to four cameras.³ Operation is fully automatic - both data and video are triggered by vehicle speed, and both include a preroll buffer to capture data and video before the trigger point. You never again have to remember to turn on your camera! Recording time is limited only by free disk space, typically 900 MB/hour at 640x480 but user configurable over a wide range, making it possible to record continuously for days. Not my videos yet, but pretty soon I should have some videos.